Celebrate the New Life Festival with the Dunmer of Stonefalls. 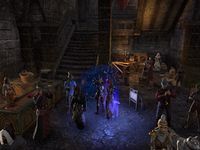 Breda, a New Life Herald in Eastmarch, spoke of Ebonheart's New Life Festival in Stonefalls. Talk to Breda, south of Windhelm. (Optional) Dance with other players in any of the four taverns. Dance at The Watch House. Dance at The Fish Stink Tavern. Dance at The Ebony Flask. The quest is received from Breda, south of Windhelm. The fastest way to get to her is using the Kynesgrove Wayshrine. She will give you one of 9 available New Life Festival quests; you can abandon a quest to get another one. Once you receive the quest, head to Davon's Watch, in Stonefalls to begin. The first place you must dance in is the The Watch House, in Davon's Watch. Go inside the inn and press E to dance. If you wish to complete the optional objective and get the Sailor's Warning Festival Grog, you must dance near another player. To do this, just make sure you are close to another player (who also has to be dancing) before you start dancing. If you wish to get the achievement, Lava Foot Shuffle, you must dance with other players at all four locations. Once you have finished dancing, you must then head to the next location, the The Fish Stink Tavern. Again, go inside the tavern and dance. Once you have danced here, you must then go to Ebonheart. Use a wayshrine or walk there, and then go into The Ebony Flask. Dance there, and then go to the final location, Hlaalu House.† Go downstairs to dance for the fourth and final time. Once you have danced in all four places, you must then go back to Breda in Eastmarch to receive your reward and XP. Make sure you use the keg nearby to get double XP before finishing the quest! †Note that the Hlaalu House required by the quest is not the private residence in Ebonheart called "Hlaalu House". Rather, it is the downstairs area of Ebonheart's unnamed city hall. To complete the Lava Foot Stomp, I should dance at the Watch House Inn, located in Davon's Watch. To complete the Lava Foot Stomp, I should dance at the Fish Stink, located in Davon's Watch. To complete the Lava Foot Stomp, I should dance at the Ebony Flask, located in Ebonheart. To complete the Lava Foot Stomp, I should dance at the Hlaalu House, located in Ebonheart. Objective Hint: Join the Celebration Downstairs. I should return to Eastmarch and speak with Breda. Finishes quest I should speak with Breda about celebrating the New Life Festival. This page was last modified on 10 August 2018, at 00:24.